So you have an interest in canoes, kayaks, camping and a love of nature in all its splendor. Well we do too! We are the Marion County Aquaholics Paddlers Group, Inc., one of Florida's most active paddling groups. 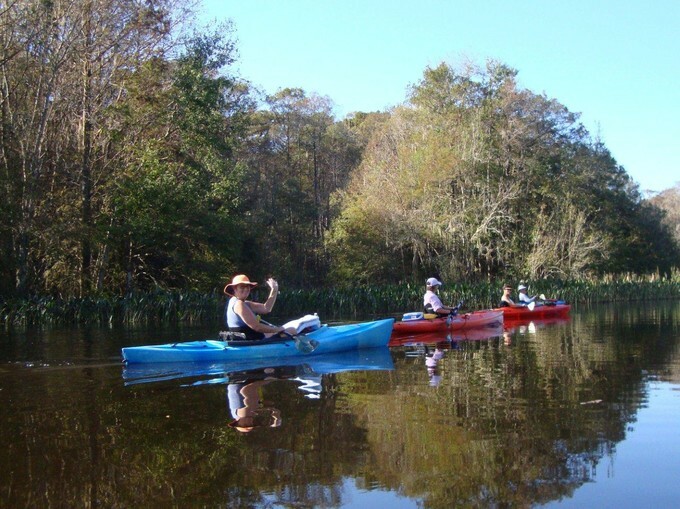 We regularly paddle numerous rivers, streams, creeks, runs, lakes and coastal waters all over Central Florida. Our periodic "Full Moon" paddles are a real treat, never to be forgotten. Each month there are at least two or more paddle trips waiting for you and even an occasional over-night campout along one of our favorite waterways. The Aquaholics are always on the go with our trips, river cleanups, club cookouts and parties, and monthly meetings. We also stay focused on Paddling Safety and Education. Our officially adopted river is the Ocklawaha with scheduled clean-ups to help keep the river pristine. It sounds like work, but it isn't. It's really a lot of fun! Our club is open to all. We are made up of singles and families of all ages and skill levels, from novice to expert. If you would like to go on an introductory paddle with us, please see the Membership Application page. Our willingness to share knowledge, abilities and information become an asset to the beginner as well as seasoned paddlers. When not on the waterways, the Aquaholics take part in civic activities related to the conservation and preservation of our waterways and springs. The Aquaholics are avid supporters of the Office of Greenways and Trails, Florida Paddling Trails Association and Ocala Outdoor Adventure Camp. Our goals are to keep what we have now for those that paddle behind us.